The only Cayman card to buy? In performance terms the Radeon HD 6950 is a rather impressive beast. Considering it's around £80 cheaper than the Radeon HD 6970, and you're only losing a couple of frames per second on most of the benchmarks, that makes it doubly so. 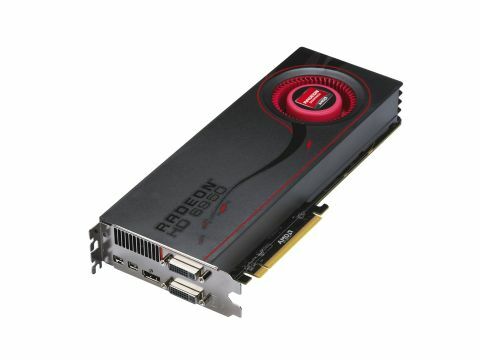 With the two cards released at the same time it makes the HD 6970 almost impossible to recommend. The pricing also puts the HD 6950 in its own little niche. At £220 it's slightly more expensive than the top-end, overclocked GeForce GTX 470s such as the MSI Twin Frozr, but manages more impressive scores at the higher resolutions, especially in DirectX 11 games and applications. Thanks to the 2GB frame buffer the HD 6950 shares with the HD 6970, as well as the high ROPs count, this card can deliver quality gaming performance across the board. Looking at the particularly tessellation-heavy benchmarks of Heaven and Metro 2033 the HD 6950 is knocking on the door of the GTX 570 too. Quite what AMD is doing releasing two incredibly similar cards at such disparate price points I don't know. The Radeon HD 6950 is hardly losing anything architecturally compared with the HD 6970. All you miss out on is two of the redesigned SIMD units and a shade lower clockspeeds. With a little judicious overclocking I'm fairly positive we'd be able to garner identical scores as the HD 6970 with this card. Saving £80 in the process. As well as having incredibly similar performance figures the cheaper Radeon HD 6950 also has less energy overheads. In terms of total system draw from the wall I was looking at around 330w for the HD 6970 with around 260w for the HD 6950. So even if it's just a few pence here and there, plumping for the cheaper card will also save you cash in the long run. If I was looking to spend around £300 on a card I would still be looking at Nvidia's GeForce GTX 570. It's got on average superior benchmark scores and while AMD has aggressively dropped the expected price of the HD 6970 to match it I wouldn't be surprised to see Nvidia fighting back on that score too. But if I was looking at spending a little less then that Radeon HD 6950 is the next step down. It's far cheaper than both the GTX 570 and the Radeon HD 6970, but is so close in performance you'd scarcely be able to tell with the naked eye. Being able to spit out performance at almost the same levels as a £300 card is darned impressive for a card this close to £200. Admittedly if we had the cash we'd go for the GTX 570, but this is definitely the next card down. The 2GB frame buffer means that this is a mid-range card that can compete at the higher end of the resolution spectrum. There's unsurprisingly very little to dislike about this Cayman card; it's pretty big and that's about as negative as I can get!